Photo: White's Aviation, 1941. Retrolens historic aerial imagery. The purpose of this article is to explain the facts and theories behind the varying locations given for the historic Halfway Houses in Glenside between 1841-1849, and in subsequent years. The dots on this White's Aviation 1941 map indicate the different locations given for the Halfway House between 1841 and today. Each one is explained below. In the 1840 -1850 era, Bush licences were issued for the sale and supply of liquor. The Bush licence went to the licensee, not the premises, therefore the location of the premises could shift according to where the licensee was operating from. Bush licences were issued to John Lodge (1842) and Anthony Wall (1845). John McKain was issued a publican's licence (1849, 1850, and 1855). The Wall's provided accommodation for people in their home, which was on a small 8 acre block sub-divided off Section 24. It's unclear where that home was located. What we do know, from Mrs Wall's letter written to her family in England in 1842, is that the track to Porirua passed close by the house, and there was a stream near by. 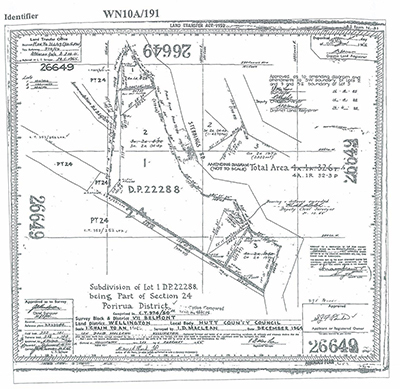 John Lodge owned a sub-division off Section 24 as well. It is unclear where his house was, however there would have been access to a water supply, such as a spring, well or stream. In the early days of bush felling, people did not always live on the section they owned. They may have shared a hut with someone else close by and walked to their section to clear it. Once the section was sufficently cleared, they could erect a small hut for themselves on their own section and work from there. 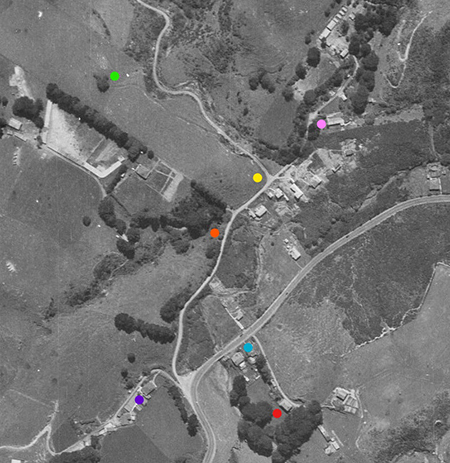 Between the green dot and the yellow dot, on the White's Aviation map, adjacent to Stebbings Road, is a wriggly track over farmland. This is a gazetted road which is named 'Accommodation Road' on early maps. The road has largely been obliterated by housing development and the construction of Burbank Road however parts of it can be picked out on the cliff face above Stebbings Road at at the time of writing (2018). The 1965 survey map below, shows detail of part of the Accommodation Road. Green dot: Section 24. Site at the top of the Accommodation Road. Len Stebbings (1909-2009) supports this site as the Wall's Halfway House. This site was farmed by the Stebbings family, who first came to live in the valley in 1863. Len Stebbings sold the farm in 1979. He believed this is the site of an early Halfway House. He referred to it as The Surveyors Arms. Len Stebbings ploughing adjacent to a possible Halfway House site (in the trees) at the end of the Accommodation Road. Photo: Len Stebbings Collection. Photographer from The Dominion newspaper. Date unknown. Interview with Len Stebbings undertaken by Claire Bibby, 2001. "As you come along Stebbings Road, there is a concrete post which was where our gate was. Above that was a conveyance road, which was also known as the Accommodation Road. It used to go up and over the paddocks before Ronnie Pender’s there, and turn back into some trees. I knew there must have been a house there, as there was a hedge and poplar tree and hawthorn trees. I was ploughing the site up and there were lots broken cups and china, bricks and all sorts. I believe it was the site of the Surveyors Arms." "When I sold the place, a lawyer from Waikanae came up and said, "That road belongs to nobody. You can claim it." It was surveyed 12 feet wide, and was a conveyance road before they made the bottom road. I wasn’t interested in owning it." Note: The Pender's, referred to by Mr Stebbing, built a house with access off Stebbing's Road. This house was demolished in about 2011 for the construction of the Westchester Link Road and was replaced by a Church on the site. Interview with Len Stebbings undertaken by Claire Bibby, 2002. "The road to Porirua used to go around the back of stream behind the houses on the hill there. It was called Stebbings Road originally but they changed the name to Glenside Road. Well, just beside our gate on Stebbings Road there was another road going up the cliff and onto our land. I showed it to you once, on that photograph in The Dominion." "It was always known by our family as 'The Accommodation Road'. I believe that there once was a sign at the bottom of the road pointing out 'Accommodation' and the road was known as 'The Accommodation Road' from then on. That’s the road I was telling you about that I ploughed out on the farm. It was the conveyance road, and the same road they came to me about, some years ago, saying I still owned part of it and would I be willing to sell it." "I believe myself that the Wall's originally had their house at the top of the road, away from the stream. I believe they built a second house lower down, by the stream later on – but the name always stuck in our family." "It used to be a lovely spot there, very very pretty. There used to be a poplar tree and a privet hedge and a lot of blue bells. I often wonder if the Wall's moved down there later. You could see the excavations of the house as you came around the corner." Len Stebbings (1909-2005), farmer, and Wesley (Bill) Secker (1922-1997) researcher, writer and historian believed this was the site of the Wall Halfway House. Bill Secker published a series of articles about historic places in the Kapi-Mana News newspaper during 1975-1979. He undertook this task for the Historic Places sub-committee of the Tawa Borough Council. The following extracts about the Halfway House are from his articles. W H Secker, Kapi-Mana News on 17 February 1976, p. 18. "In writing about historic sites around Tawa it is necessary at times to step outside the present borough boundary in order to show how the first pioneer families lived and how easy it is to remove traces connected with the early settlement period. Though land owners are entitled to develop their properties as they see fit when their plans comply with the provisions of the Town and Country Planning Act and local ordinances there is always cause for regret when a vista associated with a district has to disappear in the path of progress." "At Glenside there is a good example of the clash of interests between development of land so that best use is made of a valuable asset and the preservation of aesthetic values. The piece of land in question fronts Stebbings Road from its junction with Middleton Street (the original Porirua Road) and where it disappears from sight at the first bend." "This attractive sylvan setting with its hedgerows which creates an atmosphere of a Southern English county is destined to vanish in the not-too distant future as Churton Park and road widening destroy the peaceful atmosphere of Glenside." "The area under threat was originally surveyed as Section 22 Kinapora District. The history of development of the 114 acre section, once covered in dense bush, goes back to the first years of European settlement. The hedgerows and some of the broad leaf trees which have survived were planted soon after the first settlers arrived in the district in 1841..."
"It is not known with certainty when the [Barrow] family settled at Halfway – as Glenside was known till some bureaucrat in the old Public Works Department decided in the early 1930s it was not a suitable name for the camp serving as headquarters for the men engaged on the Tawa Flat deviation of the main trunk railway." "In 1848 while waiting for part of his Tawa section to be cleared so that a dwelling could be erected, Thomas Arnold stayed with the Barrow's at Glenside. The site of the Barrow cottage can still be made out in front of the hedgerow in the foreground. Live fences such as this were commonplace before wire became the standard article for restraining stock." "The grassy patch at the bend in the road is approximately the site where Susan Wall ran her inn, The Surveyors Arms, in 1842. Though the inn’s accommodation was rough and ready with some travellers having to spread themselves out in front of the fire wrapped in a blanket, it was far from being a grog shop and doss house." "Both the Barrow and Wall holdings were model small farms that were incapable of keeping a family above the breadline unless other employment was undertaken. The early settlement period of Tawa followed a similar pattern." W H Secker, Kapi-Mana News ,18th April, 1979, p. 8. [Secker's article has a photograph of the corner site]. "Here stood the Surveyor’s Arms inn at the Halfway (Glenside) run by Anthony and Susan Wall. Settlers who cleared the area worked as carters of goods, materials and suppliers to the troops of the 58th Regiment along the Old Porirua Road. Glenside, under Heritage NZ authority 2014/119. Archaeologist Kevin Jones investigated the site in 2018. He questions whether the archaeology he identified relates to the sketch of the Wall house, dating the archaeology for a later era. However, he noted that the river stones at an earlier archeological investigation into the site undertaken in 2005 had since been removed. He said these would potentially indicate an earlier rammed earth building and it's stone chimney. Kevin Jones writes: "They sold their ‘Halfway House’ property (ies) to McKain. This may be the house shown in Figure 3 [King sketch 1849]. If so, it is not very much like the house as identified by the archaeology and the setting well above the Porirua Stream of 1 Stebbings Road"(p. 3). 20th Century" (2018, p. 40). In 1996, Barbara Kay, MA Hons (NZ), great granddaughter of Anthony and Susannah Wall, published a history of the Wall family. She suggested the Wall's house was south of the Garrett driveway, as it was known in 1996. The Garrett driveway was on the west side of Glenside Road, opposite present day 16 Glenside Road. This is an unlikely location for the Halfway House as the land she is talking about was owned and farmed by the Barrow's. In 1848, Thomas Arnold wrote about his time living with the Barrows, who were well settled in here. No one else has suggested the house was located on this site. Barbara Kay, Anthony Wall, Settler Of Porirua. The Papakowhai Story, 1996. "The family home was not built to last. 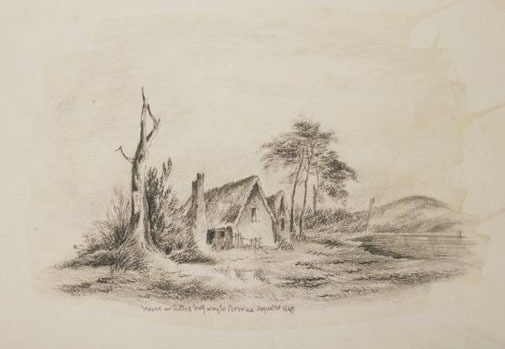 Fortunately an artist, Martha King, whilst travelling from Wanganui to Wellington, stayed in the house in August 2849 and did a pencil sketch of it. The drawing, held by the Alexander Turnbull Library, is unsigned but inscribed 'house we halted halfway to Porirua' and dated 28 August 1849. Martha King's artistic reputation is based on her exquisite botancial studies of New Zealand plants and on her careful detail. Were it not for her drawing, there would be no record of the family's first home. The house is reminiscent of a thatched English country cottage, but the clay, the raupo and the supplejack are materials of this country. Behind the cottage in the drawing can be seen a rounded hill on which there are houses today" (1996, p. 38). "The drawing gives a good indication of where the family home may have stood. On the western side of Glenside Road, south of the drive up to the old Garrett house, there is the remains of the site of a clay house, the existence of which some locals can recall. A large bay tree, the leaves of which were used as an essential flavouring for colonists food, grows there with old bricks scattered nearby. Just a step away there is a two-feet-square well dug out beside a small stream. This may have been the site of the cottage. If not, it would have been closer to the Porirua stream. The Wall home was near the track, but the track was close to the western side of the stream" (1996, p. 39). This site was destroyed in 2003 by the Callender's development for Wantwood Grove. Blue dot: Section 23. Site of the Halfway House, 1849. Arthur Carman (1952, Ed. 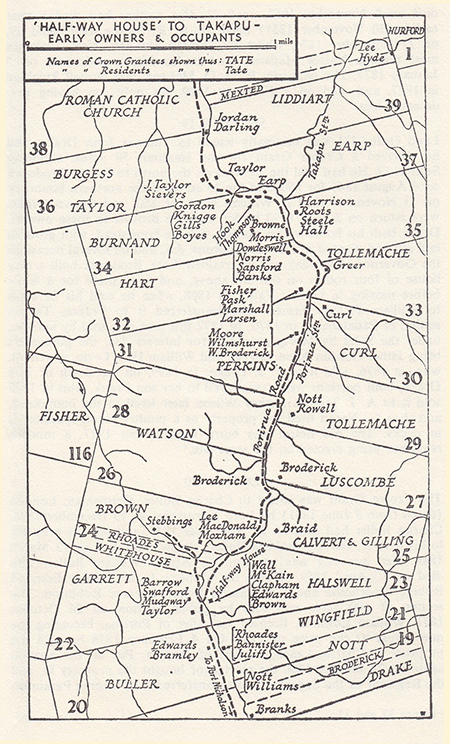 1982), R J Meyers (1990), Barbara Kay (1996) and myself agree that the Fitzgerald Map of 1849 depicts the Halfway House location when it was under the ownership of John Ward McKain. The business was subsequently bought by the Clapham's, the Edward's and the Brown's. Extract from 1849 map showing the location of the Halfway House. 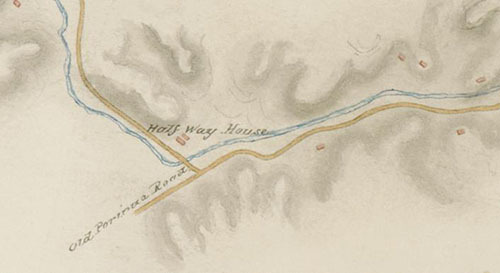 The image above is part of a map of North Road from Johnsonville to Paekakariki, Wellington showing the location of the Halfway House. An inscription on the map informs that the road was constructed by a military party of the 58th, 65th and 99th Regiment's and by a Native (Maori) party. The inscription states that construction commenced on 1 May 1846 and the road was opened in December 1847. The map is dated 1849. Before the road upgrade, the main road to Porirua was routed along what is known today as Glenside Road. In 1849 the Walls sold out to John Ward McKain. 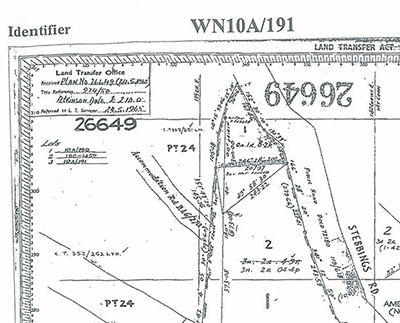 It is likely that McKain opened a new business on the newly formed road and this sketch is showing the location of the new McKain Halfway House. The location is about the entrance to the present day Twigland Garden Centre. Tawa Flat and The Old Porirua road 1842-1982 by Arthur Carman, 1956 ed. 1982. "The original track from Wellington to Porirua kept on the left-hand side of the stream, but when the road was formed [1846-1847] it crossed the stream at the southern corner of this section. It was just beyond the bridge that the old Half-way House was built" (1982, p. 71). "The first accommodation was that provided on Section 24 by Anthony and Susan Wall as early as 1842" (1982, p. 71). "The original Half-way House was situated on the south side of the road, with the stables over the road on the north" (1982, p. 71). Note: It's unclear whether Carman is talking about the Wall's or the McKain's when he talks about the 'original Half-way House'. If he is referring to the Wall's this doesnt make sense as it is unikely they would have separated their house and sheds by a bridge across a significant stream and no one else has placed them living in this locality. If he is referring to McKain's, and confusing north with west and south with east, this doesn't make sense either, as the Fitzgerald 1849 map clearly shows the stables behind the Halfway House, not across the road. Barbara Kay wrote: "Old horseshoes at 239 Middleton Road indicate the presence of McKain's stables adjacent to his hotel" (1996, p. 40). Note: The address of 239 Middleton Road is owned by Marion Rowell. She told me she had dug up quantities of horseshoes and had disposed of them at the tip and reaffirmed this in a conversation in 2018. The site may have once been a blacksmith, providing services to traveller's halting at the Halfway House. 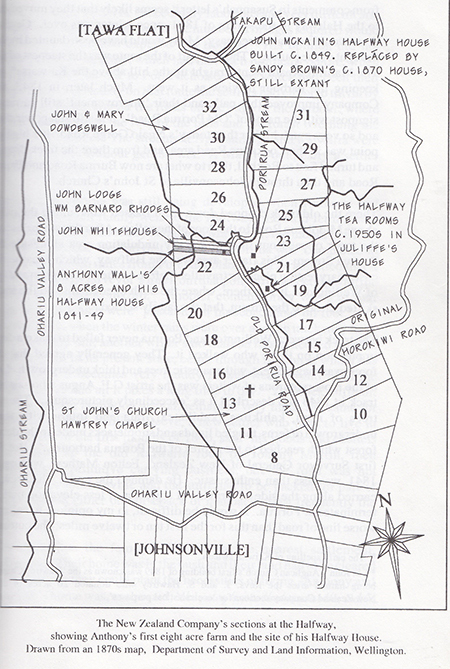 Up In The Hills, A History of Johnsonville by R J Meyer, 1990. The following extracts are from Bob Meyer's (1921-1989) book which was published posthumously. "By 1849 one John McKain was licensee of the Half-Way House at Totara Flat (Glenside). This establishment was located on the right bank of Keneperu Stream and on the opposite side of [in 1989] Middleton Street to Downer and Company’s yards. Mrs Susan Wall had originally set up this establishment when she kept beds for travellers at her farm house before moving to 'Brailsford' at Porirua. The name was derived from the fact that the house was sited about half way between Wellington and Porirua" (1990, p. 17). "With the 1858 opening of the road up the gorge from the Hutt Road to the intersection of Fraser Avenue and Johnsonville road, coach services to the north were inaugurated. These left the New Zealander Hotel in Manners Steet for Wanganui... Even with this new road it was a two day journey from Wellington to Wanganui. 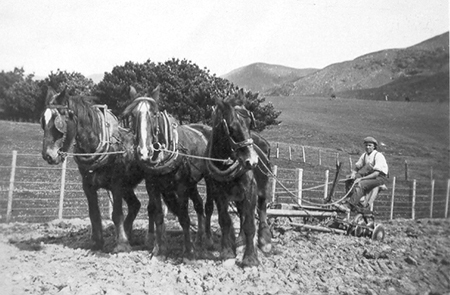 Horses were changed at the Half-Way where passengers took refreshments before continuing over Paekakariki Hill and along the beach to Foxton for the night" (1990, p. 19). Note: Bob Meyer's places John McKain's house in this location, but not the Wall's. He merely says that the Wall's originally established the business when they offered their farm house for accommodation. I feel it is unlikely that the Wall's would have built a large new house on the new road as the Wall's intention was to move closer to Porirua. Barbara Kay had the same view, when opposing the supposition that the Wall's sold up in 1849 due to troubles along the road. She said that the Wall's had bought land by agreement further north as early as 1845, with settlement made in 1848, followed by the subsequent purchases of several other blocks nearby (1996, p. 64). I surmise that the road maker's patronage of the Wall's Halfway House had ended with the completion of the road in 1847. The upgraded road, new in places, would be opening up opportunities north and the Wall's had the foresight to move north and take advantage of these. Meanwhilst, John McKain, whose family were experienced in hostilery, established new, purpose built accommodation, on the new road, to take advantage of the Wall's former clientel and the patronage of increased travel along the upgraded road. "There has been considerable historical confusion between the Wall Halfway home and subsequent accommodation houses at the Halfway. McKain's accommodation house was the first to be purpose-built, on Section 23, on the eastern side of the Porirua (or Keneperu) Stream, and opposite Anthony's Section 24" (1996, p. 40). "More confusion has arisen through an 1843 map of the New Zealand Company's sections which shows 'The Surveyor's Arms' on McKain's Section 23. The Surveyor's Arms never existed except on that map, and probably was nothing more than a longed-for dream of one surveyor, coming back to camp after a full day's work in wet bush." "John McKain's establishment was built there in 1849, taking the name of the [Wall] family home and adding his own - 'Mr John McKain's Halfway House'. McKain's was altogether a much larger building which became a local meeting place, where groups of up to fifty people would come to discuss concerns of the Porirua Road settlers. His building remained as a licensed accommodation house until the 1870's, when the last of its owners, Alexander 'Sandy' Brown, replaced it with a new building" (1996, p. 40). Arthur Carmen (1952, Ed. 1982), R J Meyers (1990), and myself agree that the house currently known as The Halfway House in Glenside, was originally built as a private home for Alexander and Margaret Brown. The Brown's operated the Halfway House business marked on the map drawn by Fitzgerald in 1849. Their new home was about 100 feet east of this business. In early newspaper's it is named "Gowan Bank". "Early in the 1870's Alexander 'Sandy' Brown occupied the Halfway House, remaining there until abut 1890. Mr Brown kept a fine team of horses, and carried out a number of big contracting jobs, and it was he who built the large two-story house, set back from the road" (1982, p. 71). "Often, and mistakenly called the "Half-Way" house, the two-storied house behind Downer’s Central Region office at Glenside was built by Alexander 'Sandy' Brown in 1885. He happened, at the time to be the proprietor of the real Half-Way house but for some reason his name was appended to his private residence. He apparently built this house in anticipation of the railway taking away a large part of his business" (1990, p. 19). "The rails reached Johnsonville in 1884" (1990, p. 29)...."Farming was firmly established in the district when in 1887 some 27 farmers held as many as 14,248 sheep between them…"(1990, p. 30). Barbara Kay writes that Alexander Brown replaced the former McKain premises with a new building and then relocated it to a site furthur back on the site. "Sandy Brown's, built in the 1870's to replace McKain's, has been removed to another site on the eastern edge of Middleton Road" (1996, p. 40). There is no reference as to what motivated her to write this comment that the Brown's house was not purpose built on it's site. Mary O'Keeffe Report (2015) Landscape plan: archaeological investigations. Halfway House, Glenside, Wellington. seen in Martha King’s 1849 sketch (Figure 17) and Captain Russell’s 1849 map (Figure 18)" (2015, p. 15). In 2018, archaeologist Kevin Jones investigated the site of 1 Stebbing's Road and compared the archaeology with the Martha King sketch of 1849. He concluded that the archaeology that he found did not match the 1849 sketch, and came from a later period, c1860-1870. He surmised that the Wall's home may have been located on the Glenugie block. This is a new suggestion, no one has suggested it before. "The house with twin gable ends, a width of 20 foot (estimated from the height of the eaves), no nearby hill slopes and a nearby stream is difficult to reconcile with 1 Stebbings Road. The location seems more like that of what became Glenugie homestead at 27 Glenside Road" (2018, p. 5). Purple dot: Section 21. Woodlawn. The Bannister homestead. Barbara Kay (1996) suggests that the house at the property 'Woodlawn' was a tea rooms. There is no evidence to support this story. According to Carmen (p. 64) the Bannister's lived there from 1873-1900, and the Juliff's from 1900-1930. The Tulloch's told me they farmed there from 1930-1963. In her book, Barbara Kay has a map with the words 'The Halfway Tea Rooms c. 1950s in Juliffe's house' (p. 35). In fact, during this time the house was a private home owned by Peter and Margaret Tulloch, who lived there from 1930-1963. It was not used as a tearooms during their ownership. They bought the property from the Juliff's, however there is no record of the Juliff's having ever operated a tearooms there and no one I have spoken to recall the house being used as a tearooms. Note: Bill Secker (1979), Barbara Kay (1996), and (Len Stebbing's (2001, 2002) do not support the theory that the Wall's occupied the site as marked on this map. Note: Local residents do not recall a Halfway House tearooms in the 1950's as depicted on her map on Section 21. It is not correct that the Juliff's were living on the property the 1950's. The Tullochs owned the land during that period and lived in the large house on the site known as "Woodlawn" and did not operate a tearooms.